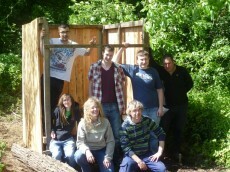 With the grant received from the Russell Commission Youth Led Grants we have built a compost toilet. It was built over three workshops in May. All of these workshops were completed by young Volunteers. They assembled the toilet, had healing sessions and had fun. The healing involved is not compulsory though it is good way of relaxing and improving your well being. This is a good example of the great days we offer at EcoDysgu for volunteers of all ages. Come and join us in our little bit of woodland paradise. For more information about forthcoming events/volunteer days please contact our volunteer officer Alexis on 01656 728137 or check out more on our website.